Inciting Event: We have a bit of a double whammy in the Inciting Event department here. 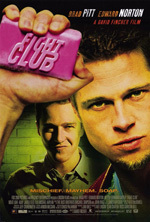 The obvious Inciting Event is when the narrator meets Tyler Durdin on the airplane and is immediately fascinated with this “most interested single serving friend he’s ever had.” The timing on this moment is just a bit late and comes directly after the narrator’s meeting of his fellow support-group troll Marla. Although Marla’s role takes a backseat for most of the story, and although it’s not immediately obvious, it’s actually Marla’s introduction that causes Tyler’s appearance. Aesthetically speaking, Tyler is the Inciting Event; realistically, Marla is. This is a really nice bit of plotting, since it’s an invisible indication of the truth of the film: that there’s actually two totally different stories being told. First Plot Point: After taking the narrator out for a drink (after the narrator’s condo exploded), Tyler tells the narrator to “hit me as hard as you can.” They end up brawling in the parking lot behind the bar—and being observed by others. First Pinch Point: Marla—high on Xanax and possibly suicidal—calls the narrator, who is now living in Tyler’s crumbling mansion. The narrator abandons the phone, only to have Tyler pick it up, fetch Marla, and begin a relationship with her—of which the narrator is jealous. This is a really nicely layered pinch point. On the surface, it turns the plot by bringing Marla back into the picture as a prominent character. Plus, it introduces the first real frisson of conflict between the narrator and Tyler. Under the surface, it’s also the first indication of the narrator’s split personality—since Marla is confused by his bi-polar treatment of her. Midpoint: When Lou—the owner of the bar where Fight Club is now regularly held—tells them to leave, Tyler allows Lou to beat him up—and then freaks Lou out with his craziness, convincing Lou to allow them to stay. Inspired by the encounter, Tyler begins assigning homework assignments to the members—signaling his digression into extracurricular ideas for Fight Club. Again, lots more going on here. We’ve also got the narrator feeling pangs of jealousy that Tyler is the one who is recognized and idolized as the leader of Fight Club—when the narrator is himself a co-founder. We also see him taking action as he (sort of) fulfills Tyler’s homework assignment by blackmailing his boss. Second Pinch Point: Tyler begins what he calls Project Mayhem, in which he recruits members of Fight Club to act as his own personal guerilla force in a campaign of social terrorism. As the narrator becomes more and more uncomfortable with Tyler’s plans and methods—and more and more uncertain of what their relationship is—this swings the plot around into its preparation for the final act. Third Plot Point: While driving home after a “mission,” Tyler admits he was the one who blew up the narrator’s condo. He then deliberately lets the car crash. When the narrator finally wakes up back home, Tyler has disappeared. This launches him on a desperate quest to find Tyler—only to come to the shocking realization that he is Tyler. Climax: Realizing Project Mayhem is inexorably about to blow up several credit-card headquarters, the narrator tries to turn himself into the police. He discovers many of the cops are Fight Club members themselves. He runs away, finds one of the bombs, and encounters Tyler for a final confrontation. Note how the conflict spirals down from broad to narrow: least important antagonists to most important. Resolution: The credit card buildings blow up anyway, but the narrator saves Marla from the Project Mayhem members who were tasked with killing her. An insomniac office worker, looking for a way to change his life, crosses paths with a devil-may-care soap maker, forming an underground fight club that evolves into something much, much more. Directed by David Fincher.